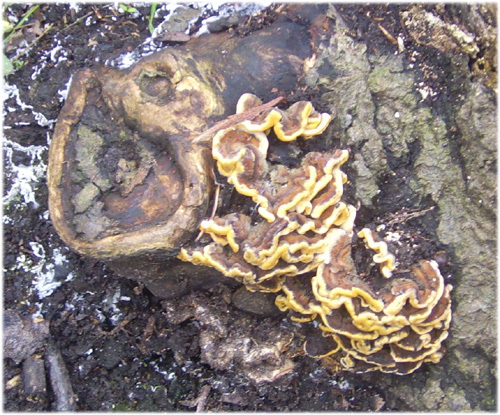 One of our most common bracket fungi, found year round on dead and decaying timber, usually shrubs and fallen wood, hosts are generally hardwoods but occasionally conifers. The bracket-like fruiting body is 3-8cm. across and generally forms end to end in tiers. 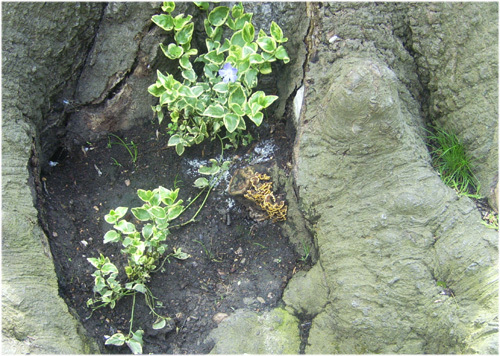 Often in exposed, open situations where the fruiting bodies are long lived. The upper surface is velvety in texture with concentric rings of brown, grey, yellow, green or black, the edge is lighter and wavey. Spooner, B. 1996. Mushrooms and toadstools. Harper Collins. Soothill, E. and Fairhurst, A. 1978. New field guide to fungi. Michael Joseph ltd.